Republicans differ sharply from Democrats in their views on the state of the economy, the tax system, government aid to the poor and other issues. But Republicans also have divisions within their own ranks. As a whole, Republicans are more bearish about the national economy than Democrats. Just 16% of Republicans rated the economy as excellent or good in our May survey, compared with 36% of Democrats. 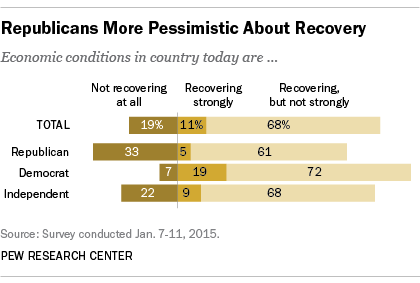 And Republicans are more likely than Democrats to say the economy isn’t recovering. One-in-three Republicans (33%) said the economy wasn’t recovering at all, compared with 7% of Democrats. In a January survey, more Republicans (63%) than Democrats (47%) said they were falling behind financially. When asked in July, Americans rated the parties about equally when it came to which would better handle the economy. The federal budget deficit remains a top issue for Republicans. About eight-in-ten Republicans (78%) said in September that the budget would be “very important” to their vote in 2016, compared with 58% of Democrats. But many Republicans express discontent with their own party on the issue of spending. Nearly six-in-ten Republicans said in our May survey that the GOP was not doing a good job representing their views on government spending. As was the case with the economy in general, the public rated the parties about equally when it came to who would do a better job dealing with the deficit. Republicans are much more likely than Democrats to say that they want to completely overhaul the U.S. tax system. Two-thirds (66%) of Republicans said in a February survey that the tax system should be completely changed, compared with 48% of Democrats. Among top complaints voiced by Republicans were that some corporations don’t pay their fair share (52%) and that some of the wealthy don’t, either (45%) – numbers substantially lower than among Democrats sharing those criticisms. About half of Republicans (53%) also said they are bothered “a lot” by the complexity of the tax system. However, Republicans are more divided on whether they would support a candidate who wants to raise taxes on wealthy Americans. About three-in-ten (31%) Republicans said they would be more likely to back a candidate who wants to raise taxes on the wealthy, 34% said they would be less likely to support one, and 34% said it was not a factor, according to a September survey. 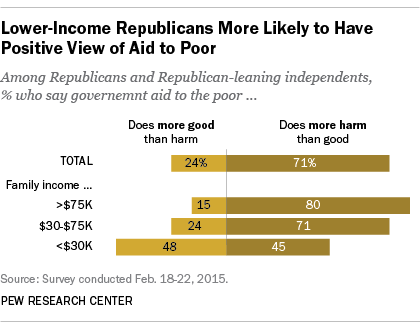 A large majority of Republicans (71%) said that government aid to the poor does more harm than good, but there are divisions within the party based on income, according to the February survey. Eight-in-ten Republicans with annual incomes of $75,000 or more say government aid to the poor does more harm than good, as do 71% of those with incomes of $30,000-$74,999. But lower-income Republicans are less likely to agree. Among those with incomes of less than $30,000, 48% say it does more good than harm while 45% say it does more harm than good. Republicans are less likely than others to believe that government investment in research is necessary to ensure scientific progress. Some 49% of Republicans believe that government funding is essential, while 47% say that private investment will be enough, according to an August 2014 survey. By contrast, 76% of Democrats say government investment is essential, as do 61% of all U.S. adults overall.